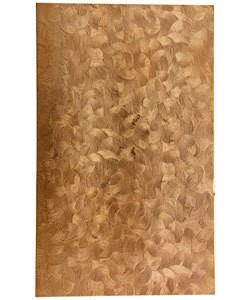 Copper patterned sheet is fantastic for a variety of uses in jewelry. Use it in mixed metal pieces to add a distinct look. You can cut it, you can shape it. Make accents, bracelets, earrings, anything you can think of. Because these strips are textured by rollers, the high pressure involved may slightly deform the texture in places. This is normal. The sheet will also have a curvature due to the rolling process. Due to the nature of the larger sheet pattern, each smaller piece may not have the exact same pattern. These patterned sheets are unfinished.